We all love the holidays! Especially Easter. It's such a friendly theme to follow with the children, and there are so many things to do. Here's a few crafts we've done that the children seemed to have a lot of fun with. Our room is so comfy with all the decorations, and the children are only getting better, and better. Materials: Rice crispies, marshmallows, a large bowl, a couple tablespoons, a microwave, large cupcake wrappers, and jelly beans. Invite the children to spoon the rice crispies, and marshmallows into a large bowl. Place it in the microwave, and watch carefully for the marshmallows to melt. This won't take very long so stay close to make sure you don't burn it. Take the bowl out of microwave, and stir it. 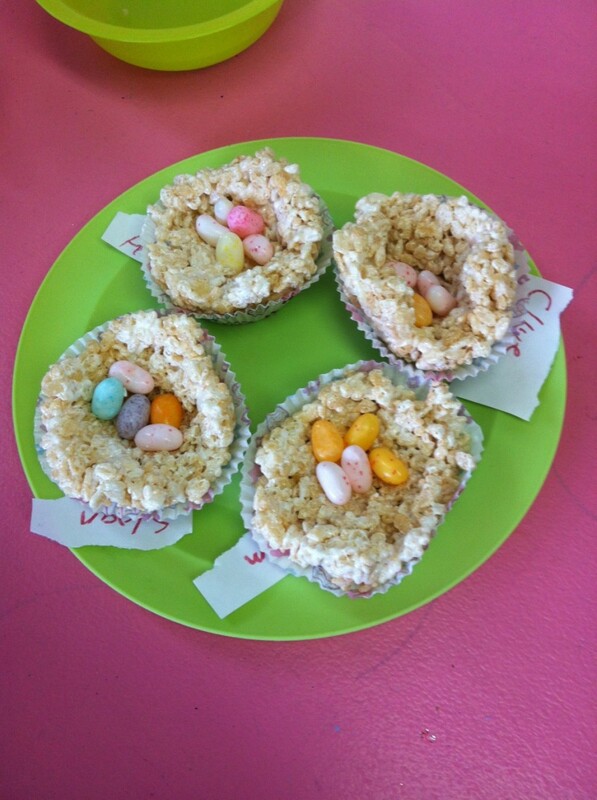 Give each child a cupcake wrapper, and spoon a large amount of the rice crispie mix into each wrapper. Invite them to mold the mix with their hands into a tiny birds nest. Decorate with jelly beans for eggs, and let them cool. They can eat these later on as a special treat. Materials: Toilet paper rolls, colored paper, white paper, printed or drawn bunny faces, scissors, glue, cotton balls and crayons. Cut out the shaped for the following from the colored paper: Ears, paws, and feet. Cut out the faces of the bunnies, and have each one in a different container. Cut some smaller ear shapes from the white paper for gluing into the bigger ear shape. All of these shapes can be made with simple ovals of different sizes. Invite the children to color the toilet paper roll, and glue the shapes to it. Encourage them to use the shapes for the places intended, but allow them the freedom to make their own choices. 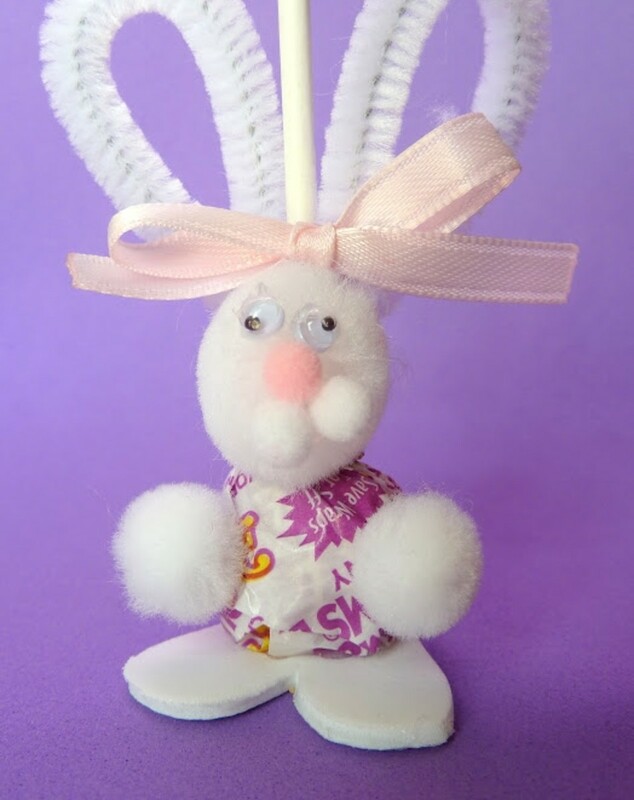 After they've glued their bunny together give them a cotton ball to glue on the back for a tail. Allow them to dry, and then the children can play with them. 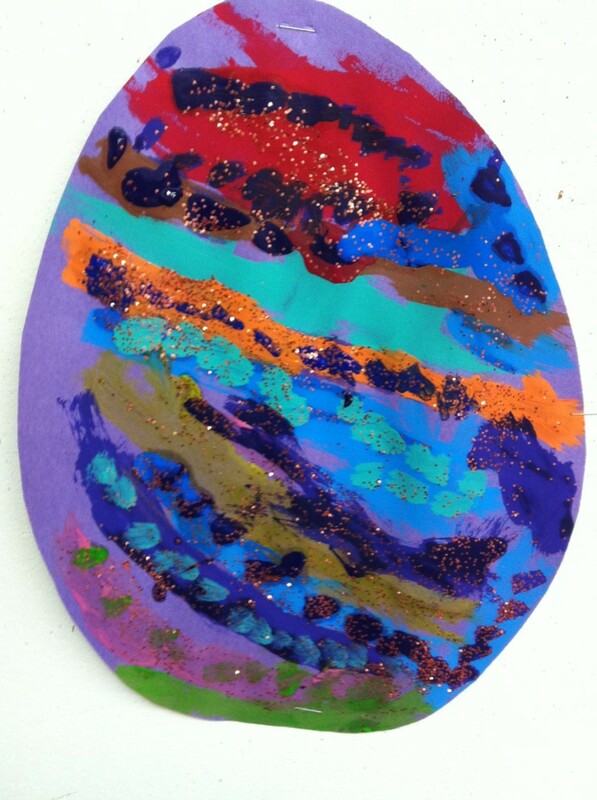 Materials: Colored paper cut into large egg shapes, paint, and glitter. Invite the children to paint the eggs however they want. 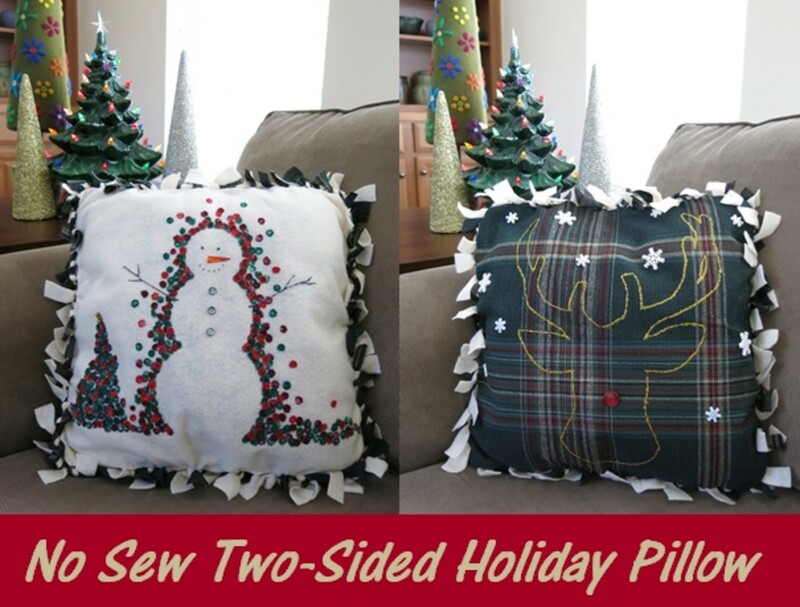 Use polk-a-dots, stripes, zigzags, and spirals. Explain how on Easter people decorate eggs with different colors so the Easter bunny can hide them for children to find. 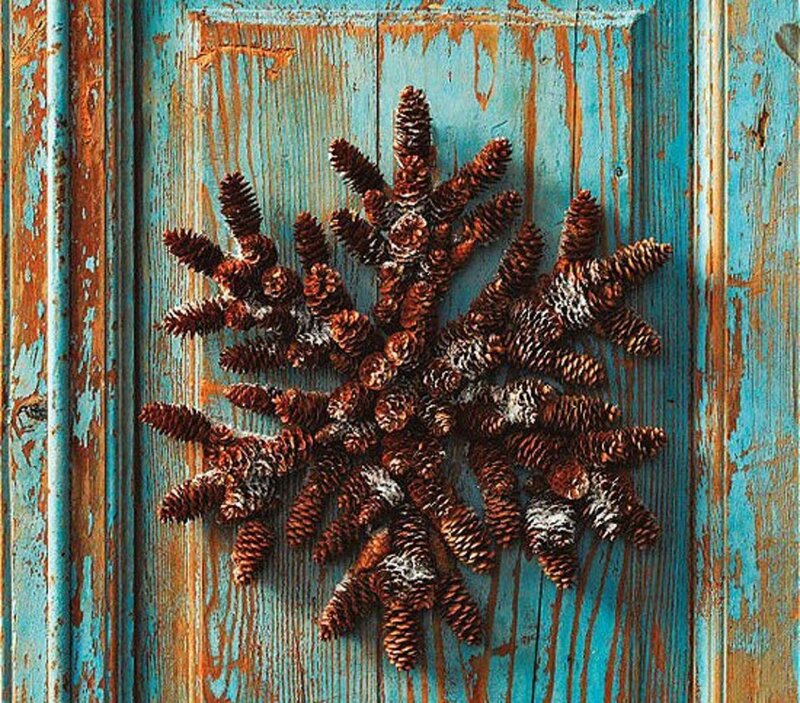 While the paint is still wet have them sprinkle some glitter over it, and allow them to dry before hanging on the wall or allowing the children to take them home. Materials: Long strips of cardstock paper, large pink paper ovals, medium white paper ovals, glue, crayons, and tape. 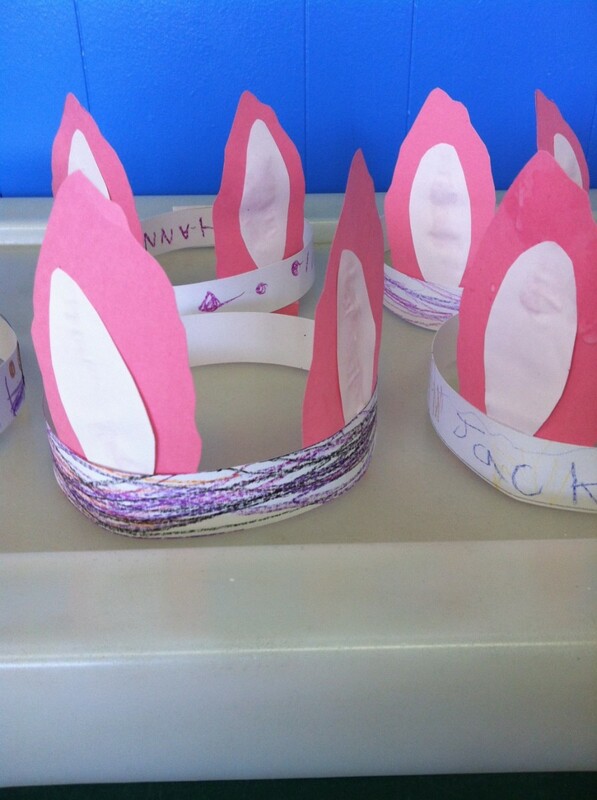 Invite the children to color the strips, of paper for their crown. Have them glue the smaller ovals into the larger ovals, and then glue them to the strips so they stand up like the bunny ears in the photo. Fit the strip around the child's head, and tape. These make a great toy for dress-up, and imaginary play. The children also have fun running around on their own, and playing their own games with them. Materials: Colored paper egg shapes, yellow paper chick shapes, glue, stickers, crayons, googly eyes, scissors, googly eyes and paper fasteners. 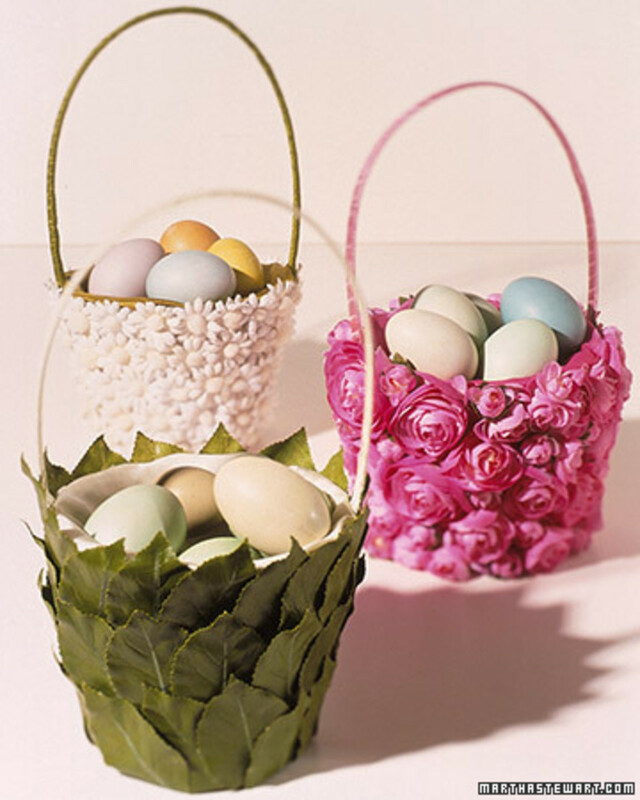 Cut the eggs in half with a zigzag cut, and invite the children to color them, and decorate them with stickers. 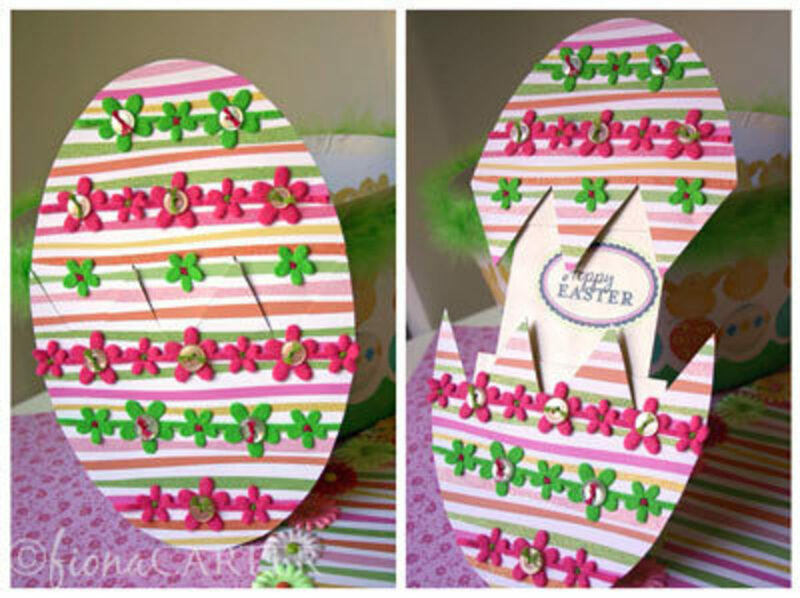 Pin the halves together on one side with a paper fastener so you can open and close the egg. Have the children glue the chick on the back of the bottom half of the egg so when you open the egg it shows the chicks head popping up. Glue some googly eyes on the chick, and let them dry. These are great for decoration, and children love playing with them on their own. Materials: White paper folded in half, and cut into bunny shapes with the fold still attached on one side, stickers, and crayons. Invite the children to color the bunny card however they choose. 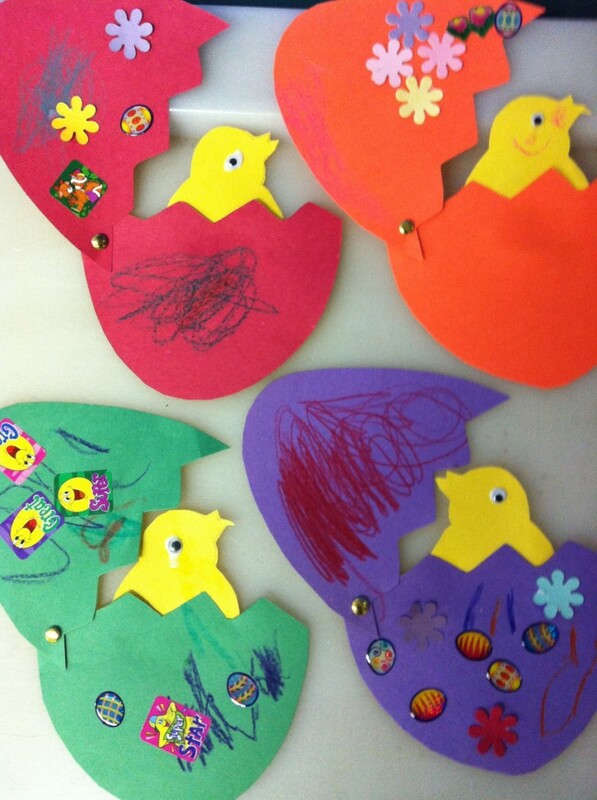 Decorate with stickers, and help them to address the card to someone like their parents, or the Easter bunny. 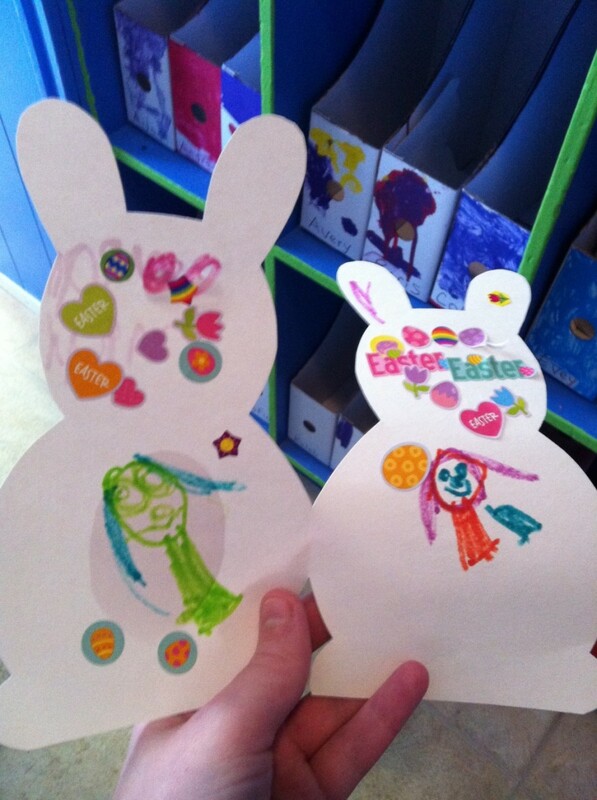 Encourage them to draw a face for the bunny on the front of the card. Considering there is no need for glue they can take them off right away, and do what they wish with their Easter cards. 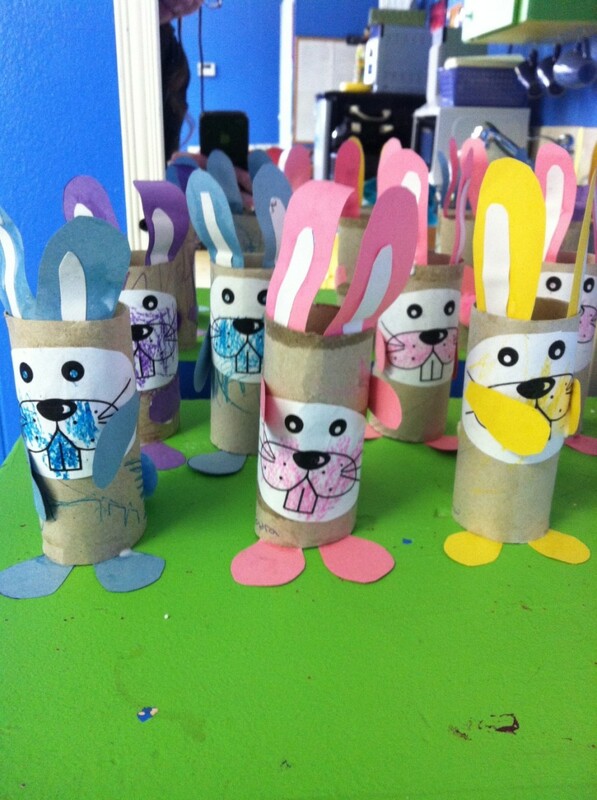 Love the toilet paper roll bunnies, so cute. Great ideas for the kids to get in the Easter spirit. I love the little toilet tissue guys. Kudos to you for giving simple and cute ideas for kid's crafts. They are cute and the materials are readily available. Voted adorable and shared. Great hub! I have done the Bunny Hats, Easter Bunny Cards, Paint and Sparkle Eggs, and Rice Krispy Easter Nests before. All of these ideas are great ideas. You should come check out some of my hubs for some more spring ideas including songs as well. After seeing all these stuffs, anyone would like to become a kid and enjoy with all these stuffs. Great compilation. I am surely going to try a few of your ideas. I'll have to try out those Rice Crispie Easter Nests. Cute! Little Foundations, Great Hub, congrats on the Hub of the Day. Stunning images and definitely a lovely project to try out with the little ones. Congrats on the hub of the day award! 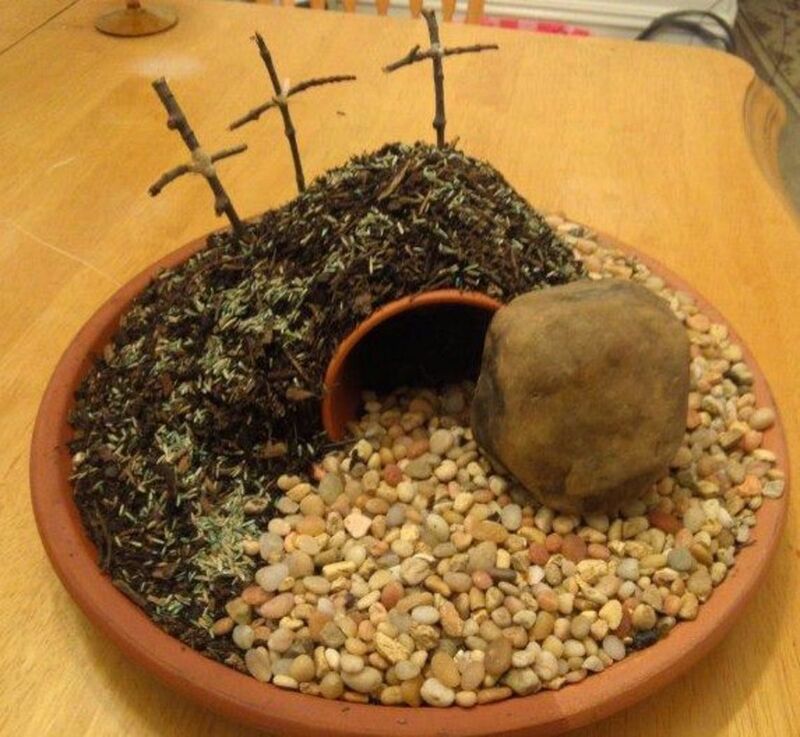 This is definitely creative ideas for kids at Easter time. Awesome! Thanks for sharing. The ideas are very interesting and easy too. Love your ideas. Sharing and pinning! The nests are do adorable, great idea! Thank you for sharing some easy crafts for the kids. I know my kids made some of those during elementary school. I saves some of them. I love the hatching Easter chicks! That is such a cute craft, and perfect for little ones! My personal favorite is the Rice Krispie nests, because I love Rice Krispie treats. Yum! First of all, congratulations on becoming Hub of The day. I really love those rice crispy Easter nests. I loved reading your Hub. Awesome! Your mind truly got those amazing ideas and creativity. When i'll be visiting my nephews I'll show to them, I'm sure they'll love it. These are great ideas! Especially the paper bunnies. This will be so cool...having a Hub my little 7 yr old can come and check out. Nice job. This hub is great because not only was it well written, it provided parents with several activities to engage upon their children, including young children. My favorite is the rice krispie treat nests because you get to eat it! Good job. Great ideas and so simple to create. I love the egg idea. Voted up and shared. Wow.. 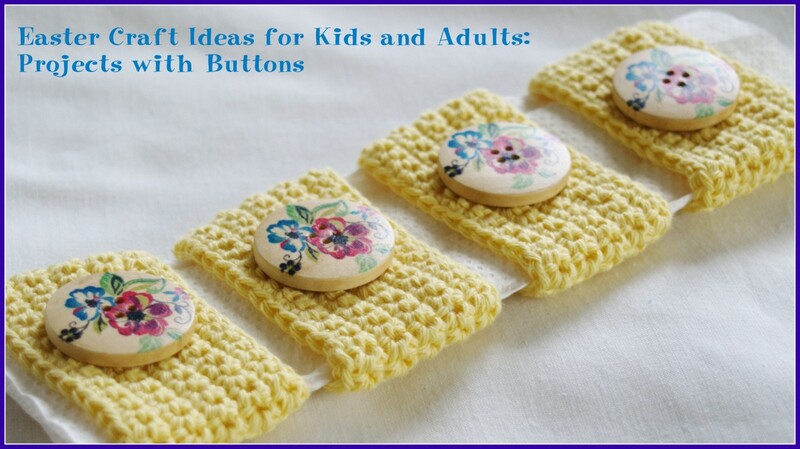 This ideas are so creative and wonderful and children will love to do it. It is perfect for my 6 years old nephew. Thanks for sharing.